I really like this Les collaboration. I really enjoy the far out mood and all the great technical play. Lennon and Claypool go together like peas and carrots. I love it. Check out this one for yourself. 'Monolith Of Phobos' was GREAT! Loved the Detroit show. 'South of Reality' is Awesome! Can't wait for the 'meet and greet' with Sean &amp; Les at the Detroit show April 27th! Their music is all their own, unique and original with no appologies. Also love 'Lime and Limpid Green'. Wish it was released on CD. Keep pushing the envelope!!! Monolith of Phobos was a tough act to follow, but they've managed to out-do themselves with this brilliant follow-up. It's an early candidate for album of the year. Rapidly becoming one of my all time favorites. Lush sounds draw the listener in. Is it such a good idea to listen in my car? Ah but it makes for such an interesting trip! Claypool's bass tone is killer. Lennon adds great guitar &amp; vocals and together its just awesome! Awesome record. Sounds great! 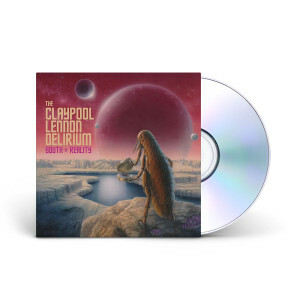 Love the style Claypool and Lennon do in their music. It is definitely a different style than most and that is what makes it so intriguing and unique! Little Fishes I believe is one of their best songs on this album. I loved seeing the concert for the first LP, can't wait to see them again, the first release sounds incredible.